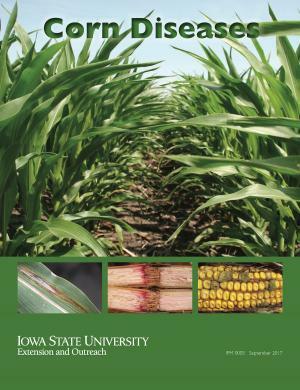 To help farmers and agronomists identify, scout, and manage corn diseases a new Corn Diseases booklet, published by Iowa State University Extension and Outreach, is now available to crop producers and industry professionals. The up-to-date publication provides current recommendations for management, along with identification and scouting information. Also included are illustrated disease cycles for primary diseases, a foliar disease estimation chart, and corn growth and development and staging information. “We update these publications every so often to make sure they remain current with new information and to increase the usefulness to farmers and ag business personnel,” said Adam Sisson, extension specialist for the Integrated Pest Management Program at Iowa State University. 1) New disease listings that include bacterial leaf streak and tar spot. 2) New hi-resolution images to help with identification. 3) Corn growth development and staging charts, now included. 4) New disease cycle illustrations for major corn diseases in Iowa. 5) Foliar disease estimation chart. The Corn Diseases publication is available to purchase online at the Extension Store. A hard copy of the publication costs $5, but you also have the option to order it in boxed quantities of 50 for a reduced price of $3.50 per publication. Printable downloads are $2.50 each. To stay updated on where specialists are seeing crop diseases, insects and weeds across Iowa, visit ICM Blog, and look to ICM News for management recommendations based on current conditions.